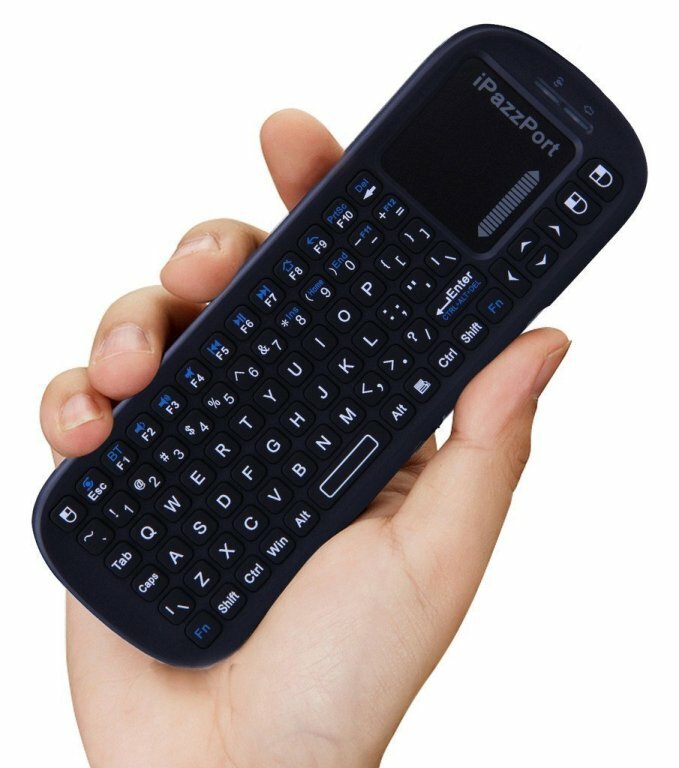 This mini wireless Bluetooth QWERTY keyboard with back case is specifically designed to gives you the simple ability to enter text for searches, passwords, router connections, to hold together your tiny Apple TV 2th and 3th remote, and to secure you remote and make it bigger and flexible. 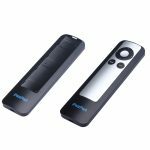 Apple TV box is one of the most popular streaming devices on the market today! And its original remote is simple, sleek and powerful. While its tiny size and on-screen input style are really pains in their necks. 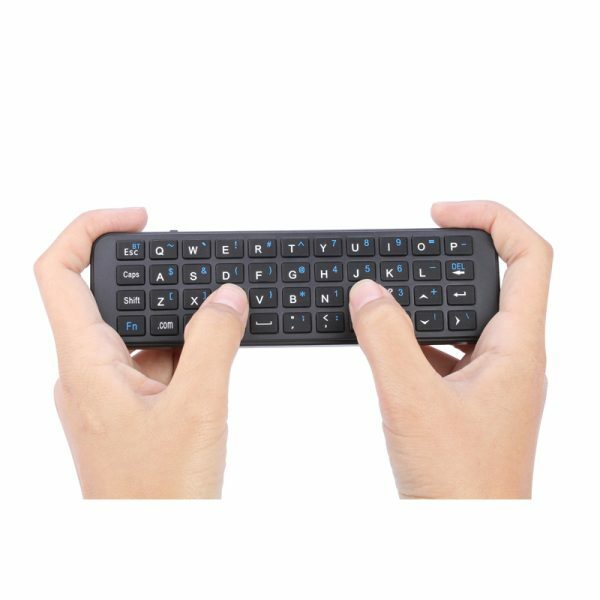 We deliberately released this bluetooth keybord remote to advance your experience on Apple TV box, inspired by the complaints on Amazon and feedbacks that users like to type in a traditional keyboard format instead of the hunt-and -peck method with the standard Apple TV remote, and are tired of searching all the sofa for that tiny original remote. 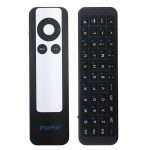 One of the complaint is that the original remote is likely to lost in the cushion and to be crushed or get ruined by their children and pets. We offer a solution by packing your tiny remote in the back case as a pretector. 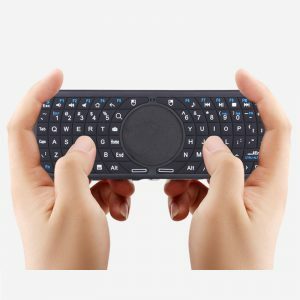 Now that this keyboard combine Your Apple TV remote into a single unit, they will never escape your eyesight, fall apart off the table easily, or lost in cushions. 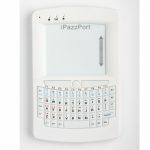 Thanks to its QWERTY keyboard layout, shortcut keys and the function keys, this keyboard makes inputting letters smooth, precise and time-saving. 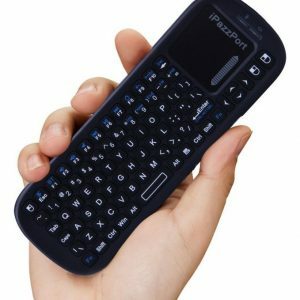 which is to help you out of that time-consuming onscreen input with your original remote. The combination (the keyboard in the front and Apple TV remote in the back case ) is much effective . 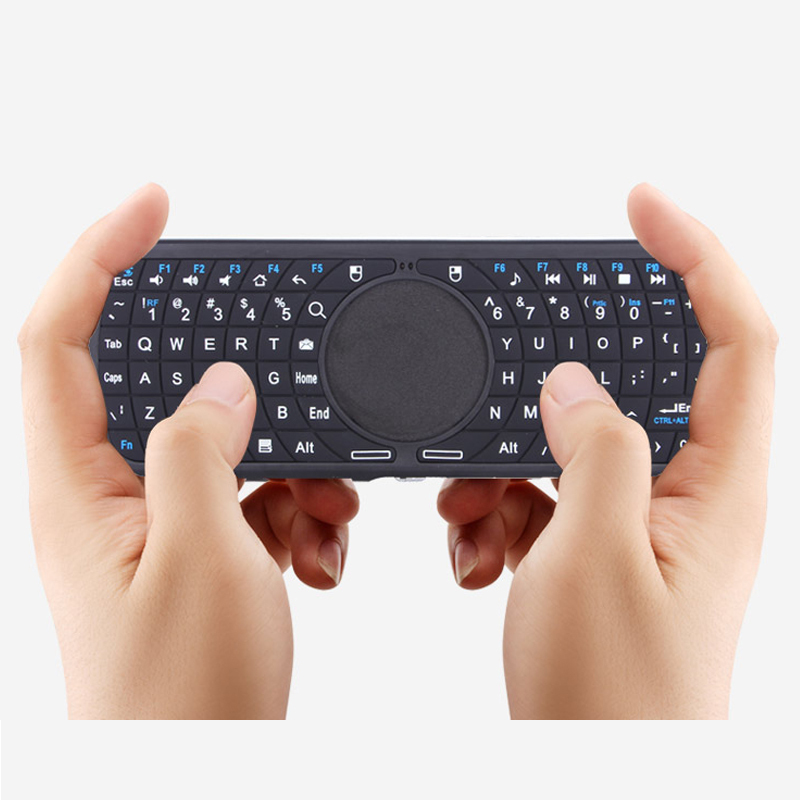 Just start to use the Keyboard on top for text entry, and flip it over for the convenient use of your existing remote, it is convenient and flexible enough. 1)Is this compatible with other systems like android or the nvidia shield tv? Yes, As long as it works on Bluetooth it works with anything. But fits the apple remote in the back. Now that the new apple tv has bluetoot, i can´t see why not. 3)Does it allow changing of the volume on the TV while using the Apple TV box? 4) Can the keyboard pair with multiple devices at the same time? I have apple tv and a samsung smart tv and don't want to constantly re-pair devices. Sorry, it can't pair with multiple devices at the same time. 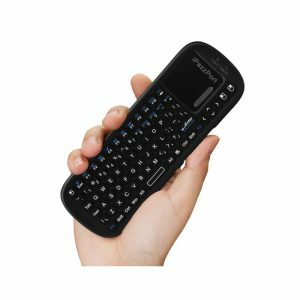 5) Does this remote work with batteries or does it have to be charged? If so, How is the battery life? 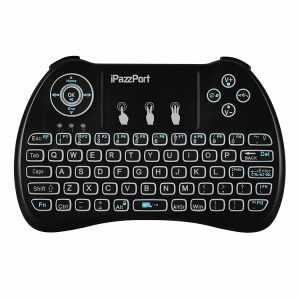 The keyboard has a built-in rechargeable battery that must be charged with a supplied charging cable timely and properly. To prolong the standby, please switch off it if you don’t want to use it within rather a long time. 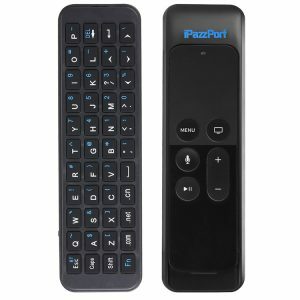 6) Does this keyboard work with the new AppleTV Gen 4? Yes, it does since it has Bluetooth on the Apple TV Gen 4. 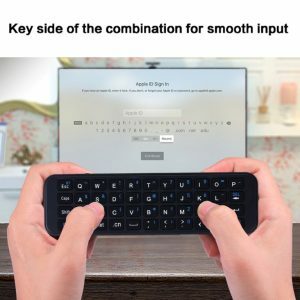 As a matter of fact, it will work on anything that accepts a Bluetooth keyboard. 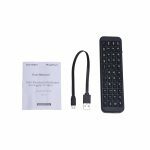 Note: this keyboard works for Apple TV 4th , but its back case doesn’t suit. 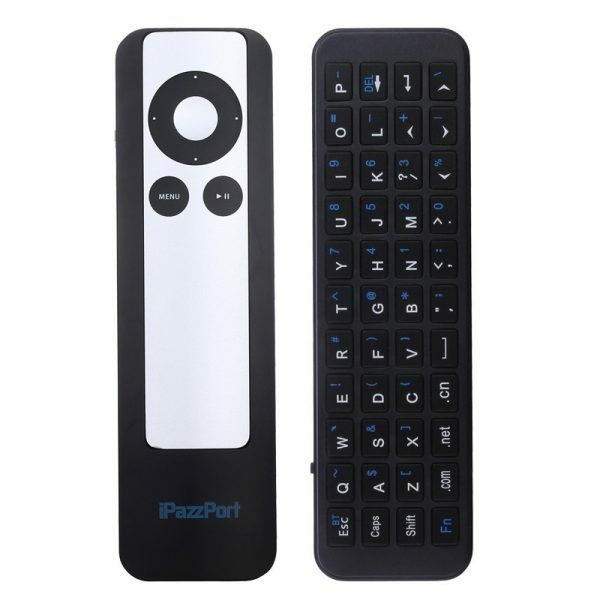 The back case of the Bluetooth keyboard is specifically designed for Apple TV 2,3th remote. 7) Does this work without the remote? We have lost ours. Yes，but you have to borrow another Apple TV remote to get this keyboard to sync to your Apple TV box. 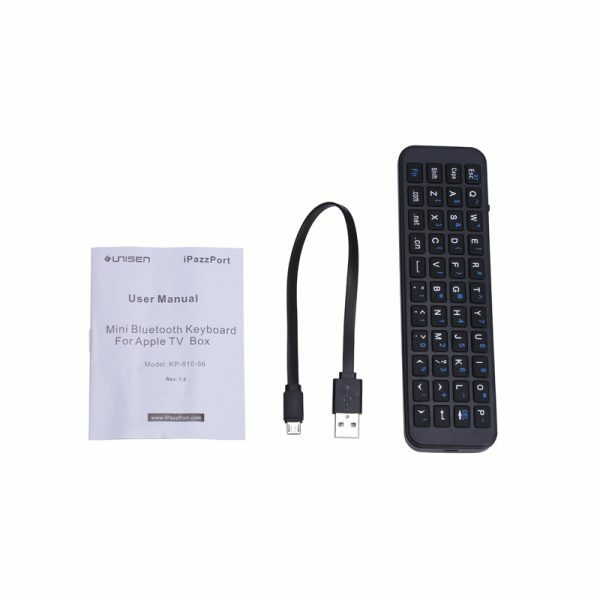 With touchpad combo and QWERTY layout, this mini handled 2.4Ghz USB mulitimedia keyboard is used as a universal keyboard remote to operate USB enabled devices like Raspberry pi ,PC, XBMC ,PS4 ,Android /Google TV Box etc in browsing web, watching movies, playing games, enjoying home entertainment, performing training, education ,meeting and presentation. 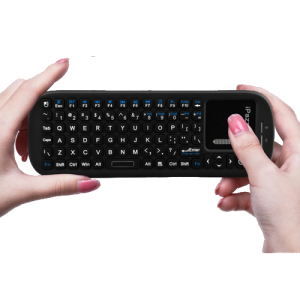 This Mini Wireless multimedia Bluetooth keyboard with TouchPad combo is used to slide mouse cursor and write on screen, emphasize words and objects thanks to its QWERTY layout, track pad and scrollbar, available for Android TV BOX, Raspberry Pi, HTPC/ XBMC, PC etc. 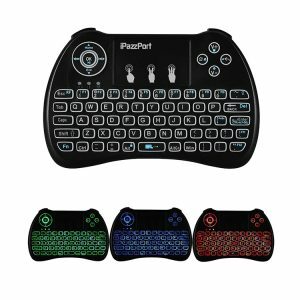 This mini multi-functional keyboard with touchpad boasts 3 impressed features, namely the slim and ergo design, emphasizing media playback, and left and right mouse on the top your thumbs can reach easily. Of course, its skin-friendly surface and RGB backlit are bonuses for you. It is widely used with almost all USB-enabled devices of popular OSes in daily life. 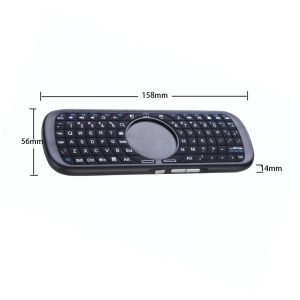 With circle touchpad in the middle, as well as multimedia keys, shortcut keys, browse-friendly and game-friendly buttons, this handled elegant mini USB keyboard is a must for home entertainments, multimedia interaction, common gaming play, HTPC/IPTV/smart TV(box) , acting as a mini universal l controller or convenient data input device. 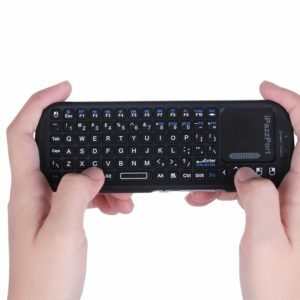 With a specifically designed case in the back, this mini wireless bluetooth QWERTY keyboard is to advance your original TV remote, such as to input letters smoothly for searching your favorites, make it bigger to avoid being lost in the cushions, and prevent the glass remote from being broken or crushed.